» PC Pilot Featuring Prepar3D v4 – Out Now! The new September/October issue of PC Pilot is now available! Prepar3D v4 is featured as this issue’s cover story including a full review. More details on this release can be found on PC Pilot’s website here. Originally launched in 1999, PC Pilot is the world’s best selling flight simulation magazine. 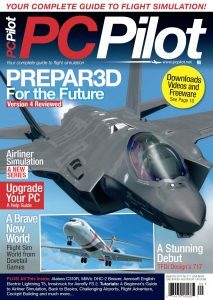 More information on PC Pilot including how to get the latest issue can be found on their website http://www.pcpilot.net/.